On Monday, 23 July 2018 Matthew Bogdanos, Senior Trial Counsel in the Office of New York County District through Attorney Cyrus R. Vance Jr., submitted an Application for Turnover in support of an order pursuant to N.Y. Penal Law §450.10 (Consol. 2017) and N.Y. Criminal Procedure Law §690.55 (Consol. 2017) authorising the transfer of a circa-1st-century CE marble head of Alexander the Great as Helios, the Sun God, seized pursuant to a previously executed search warrant, from the custody of the court, to the custody of Italy. Under order of the Supreme Court of the State of New York, County of New York, the antiquity had been seized at Safani Gallery on February 22, 2018 and was taken into evidence as part of a state investigation seeking to demonstrate the crime of Criminal Possession of Stolen Property in the Second Degree. This seizure was based on suspicions that the object had been stolen and at some point illegally exported from the country of origin in contravention of Italy’s cultural heritage law (No 364/1909). Since February 22nd the object had been retained as evidence by the New York authorities pending confirmation of a formal request from Italy formally requesting intervention and while the legal case advanced through the New York legal system. In terms of its history, court documents set out that the head was discovered during excavations of the Basilica Aemilia, located on the Via Sacra. 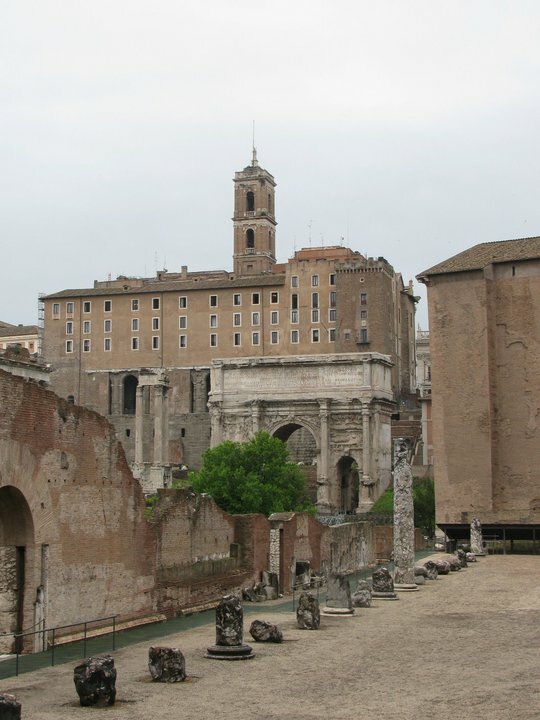 This is the ancient road between the Capitoline Hill and the Colosseum located within the Roman Forum in Rome. While little remains of the Basilica Aemilia today, it was considered by Rome historian Pliny the Elder to be one of the three most beautiful elements of the Roman Forum, this alongside the Forum of Augustus and the Temple of Peace. The head was discovered at some point during Italian research excavations carried out by Drs. Professors Giacomo Boni and later by Professor Alfonso Bartoli which were carried out on the Palatine Hill between 1899 and 1939. 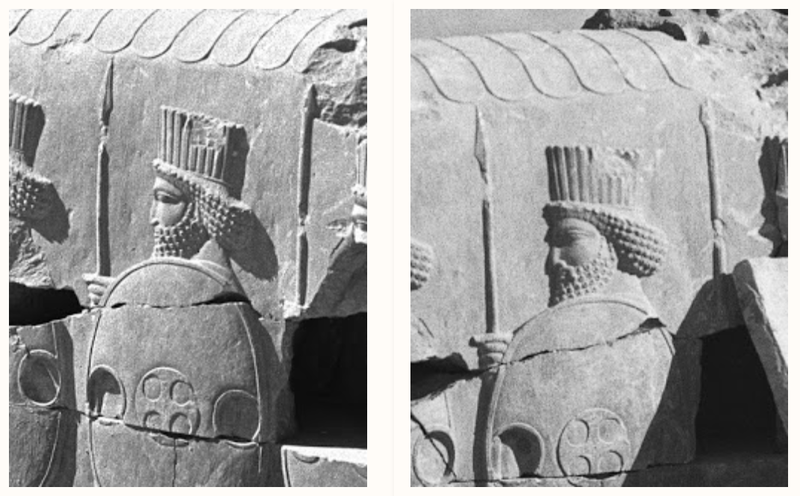 Documentation from the excavations suggest that the head belongs to one of the “Statues of Parthian Barbarians” which once adorned the Basilica. After 20 BCE Roman art often portrayed the people of the Empire and during its restoration in 14 BCE, Augustus chose to line the Basilica with a series of Parthian figurines, perhaps in humiliation of Rome's ancient foreign enemy. 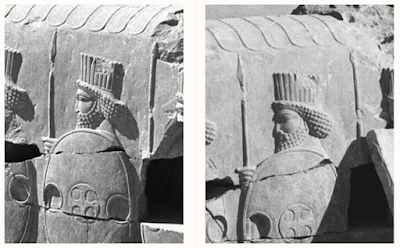 Representing individuals from the Parthian Empire (also known as the Arsacid Empire), these likenesses depicted the conquered Parthians as representatives of the Orbis Alter, subjects of Rome not considered to be part of the “civilised” world. Stylistically, they differ from representations we have from the same period of people from the Orbis Romanus. According to court documents, the Italian Soprintendenza alle Antichità Palatino e Foro Romano began keeping archival photographic documentation of the objects discovered during the lengthy excavation starting in 1908. 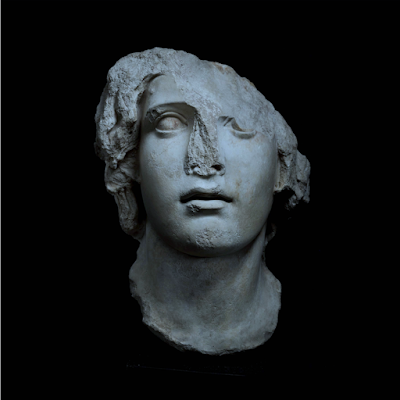 Based on these records, the head of Alexander the Great, seized from the New York gallery, is believed to have been discovered during the second phase of excavations. These began after 1909. This dating is derived as the Italian authorities have no written, descriptive entries or photographic archival documentation of any marble head finds from the Roman forum of the Barbarian statues prior to 1909. It was also not until September 1909 that Dr. Professor Bartoli's team began their explorations in the zone of the Basilica Aemilia. As a result of this and other evidence described in the Court's Application for Turnover it seems most likely that the marble head was likely found sometime around 1910. Bear in mind 1909 is a critical date as it is this year that Italy's Code of the Cultural and Landscape Heritage (No 364/1909) was made into law. According to this law, there is a presumption of the State's ownership for all archaeological objects discovered after 1909, unless the cultural Ministry acknowledges that the object does not have a cultural interest, something it would never do for objects located in the Roman Forum. Italy's archival records from the Forum excavation document an image of the head of Alexander, taken after it was excavated, resting separately on a table at the Museo Forense cloister as well as other photos where the ovject is pictured with additional finds. While the date of the actual theft of this head and another second missing object, which was also stolen, is undetermined the incident is believed to have occurred sometime before 1959. What we can define with certainty, on the basis of the dating of the archival photograph, along with the excavation records of the start date of the Basilica site excavation, and documentation of the dates the Museo Forense cloister would have been available to be used as a evidentiary photographic venue, is that this object indisputably originated from Italy. Predicated on the foregoing evidence, it can be proven that the marble head of Alexander was removed from Italian territory after the 1909 law was enacted. It is on this basis that the object has been defined as stolen property by the State of New York, as its removal from the custody of the Italian authorities was in contravention of the 1909 Italian law. Also, according to New York law, a thief can never acquire good title. It should be noted that the removal of the head of Alexander from the Republic of Italy without an export license from the Italian governmental authorities authorising its removal from the territory is also a further violation of Italian law. Interestingly though, like many stolen works of art illicitly obtained, antiquities remain fairly easy to launder, being sold over and over again through a lack of adequate due diligence in some of the finest, legitimate marketplaces and to and through some of the richest collectors in the world. In this instance, the Alexander head has sold in the United States and in the United Kingdom on multiple occasions. But where was the object bought and sold? 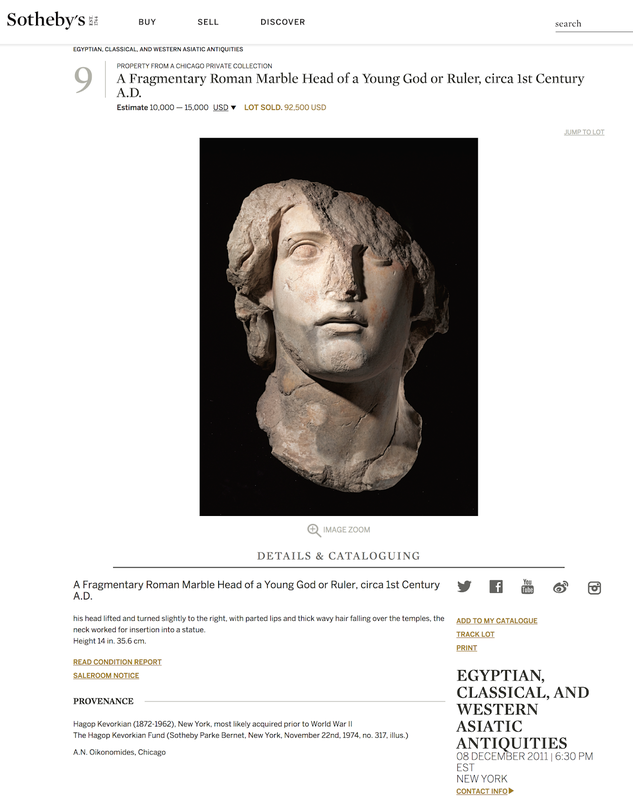 While the documentation of this object's collection history is spartan, we know that on 22 November 1974 the head of Alexander sold for a mere $650, having been consigned by the Hagop Kevorkian fund to Sotheby Parke Bernet. 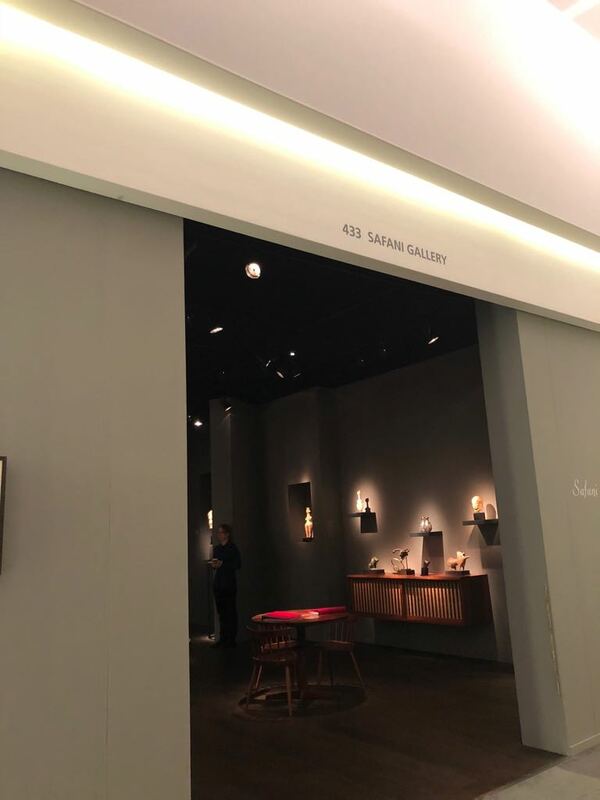 Sotheby’s Auction House acquired Parke Bernet Galleries in 1964 and adopted the name Sotheby Parke Bernet throughout the 1970s. Today, that auction house is known simply as Sotheby’s. The buyer at the time was listed only as "Altertum Ltd."
Sometime after that date the object was then purportedly purchased by Professor Oikonomides who indicated to others that he purchased the object while vacationing in Cairo, Egypt sometime between 1984 and 1986. The object was then bequeathed to Dr. Miller by Oikonomides when he passed away in 1988. On 08 December 2011 the object sold at Sotheby's for a second time during Sotheby’s Egyptian, Classical and Western Asiatic Antiquities sale . But with very little in the way of documentation to confirm this narrative. The object ultimately sold to an unidentified buyer for $92,500 USD. In May 2017, the head of Alexander surfaced across the Atlantic. 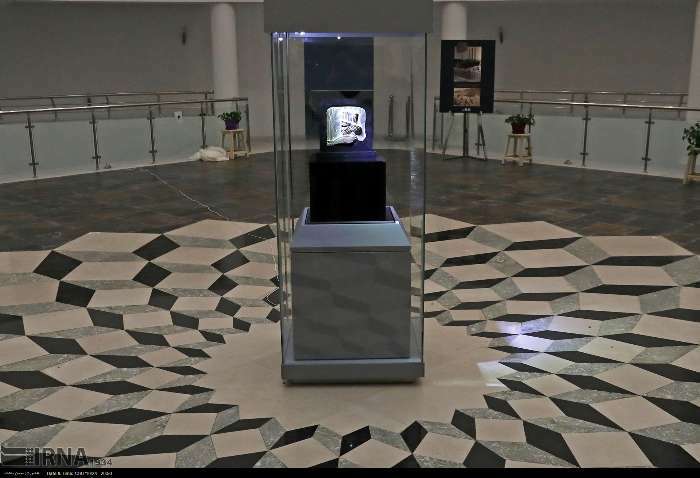 This time the ancient marble head went up for sale in the United Kingdom, having once been in the possession of former Qatari culture minister and cousin of the current ruler of the oil-rich Arab country, Sheikh Saud bin Mohammed Ali Al-Thani. Before his death in 2014 Sheikh Saud Al-Thani was believed to have been the world's richest art collector. Through Classical Galleries Limited, UK the Sheikh’s foundation sold the head of Alexander on to Alan Safani of Safani Gallery for $152,625 on June 20, 2017. By an amazing bit of serendipity, on 19 February 2018 Dr. Patrizia Fortini, Director and Coordinator of the Archaeological Site of the Roman Forum and Palatine Hill chanced upon an advertisement which featured a photo of the stolen head in a publication for the upcoming 2018 Fine Arts Expo known as TEFAF. In the dealer's documentation, a photograph of the head had been included highlighting Safani Gallery's offerings for the upcoming Maastricht sale due to be held in the Netherlands, March 10-18, 2018. 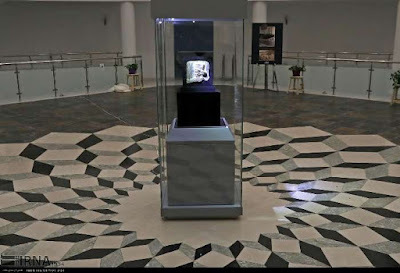 The photo in the advertisement and the old archival documentation photo of the head in the Museo Forense’s cloister were one and the same object and as a result, Italy moved forward in requesting the object's seizure. Under New York law, barring the expiration of the statute of limitations or application of the laches doctrine, one cannot obtain title from a thief unless the present-day possessor's title can be traced to someone with whom the original owner voluntarily entrusted the art. As clear title is not possible in the case of Italy's marble head of Alexander, it will be up to Safani and his counsel to see if they will base their case on the laches defense or voluntarily relinquish the object. What is clear is that the plaintiff, in this case Italy, has not unreasonably delayed in initiating their action. The purpose of the doctrine of laches is to safeguard the interests of good faith purchasers, in this case of lost/stolen art, by weighing in the balance of competing interest, the owner's diligence in pursuing their claim. While delay in pursuing a claim for the head could be considered in the context of laches under New York law given that the theft occurred at an unknown time so many years ago, it has long been the law of this state that a property owner, having discovered the location of its lost property, cannot unreasonably delay in making their demand upon the person in possession of that property. As Italy acted quickly as soon as the ID was confirmed, this course of legal action doesn't seem to be a viable route for retaining the objet in question. To view the New York Application for Turnover in its entirety, please see here. To view the New York February 22, 2018 Seizure Order, please see here. 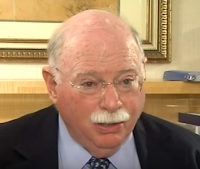 The Manhattan District Attorney's office has confirmed that they have taken custody of a second object from the New York City residence of Michael Steinhardt located during their earlier January 24, 2018 warrant execution. The seizure warrant for the removal of these both objects states that the described property constitutes evidence, and tends to demonstrate, that the crime of Criminal Possession of Stolen Property in First Degree – NY Penal Law 165.54 was committed, e.g. 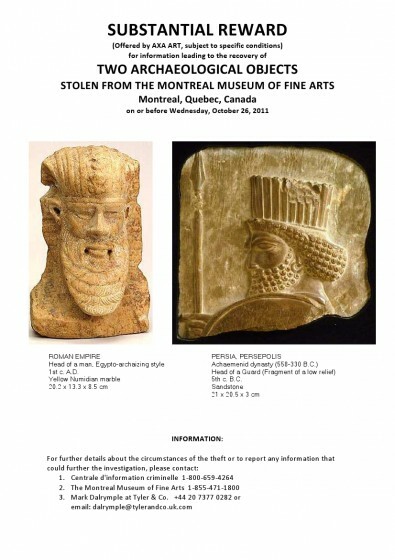 the possession of stolen or illicitly trafficked antiquities. Those convicted of Criminal Possession of Stolen Property in First Degree face a mandatory minimum sentence of one to three years and a maximum sentence of up to eight and one third to twenty five years in state prison. 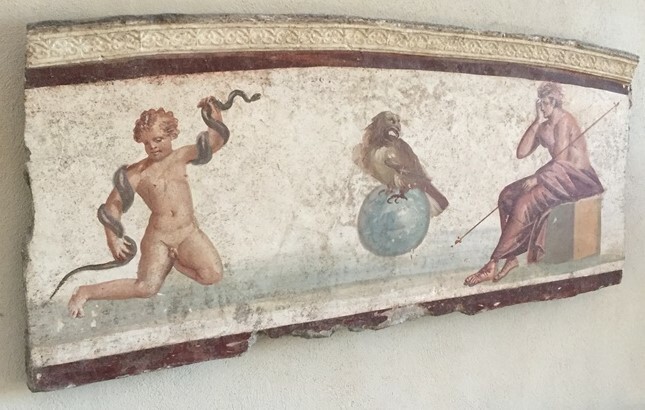 The second object seized on January 24th is a Roman frescoed panel of a mythological scene, believed to date to the first century CE. Depicted at the top of this article, the fresco fragment illustrates the infant Hercules on the left, strangling a snake which has been sent by Hera to bring about his death. Jove, the god of the sky and thunder, and king of the gods in Ancient Roman mythology, is depicted in the centre of the panel in the form of an eagle alight on top of a globe. To their right is Amphitryon. According to the New York warrant, the fresco fragment, likely a wall painting, is believed to have been purchased by Steinhardt in 1996 for approximately $600,000 USD. A person is found guilty of criminal possession of stolen property in the first degree when he knowingly possesses stolen property, with intent to benefit himself or a person other than an owner thereof or to impede the recovery by an owner, and when the value of the value of the stolen property exceeds $1,000,000. If charges are filed against Steinhardt under the New York Penal Law 165.54 this offense would be classified as a “B” non violent felony. Probation and community service are not options. A copy of the public domain record for the January 24, 2018 Search Warrant at Michael Steinhardt's apartment filed with New York County relating to this case can be found in the case review file on ARCA's website here. 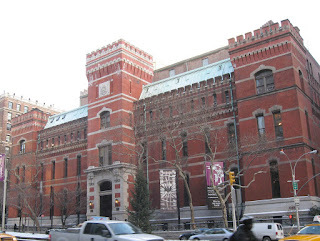 In ARCA's December 25th blog post ARCA published the criminal complaint filed in Manhattan Criminal Court, signed by Special Agent Brenton Easter of the Department of Homeland Security, which indicated the charges presented against New York art dealer Nancy Wiener through her gallery Nancy Wiener Gallery. Today we have thought to publish the sentencing guidelines should this defendant be convicted of the charges as well as a bit of distilled information about the individuals mentioned in the body of the New York criminal complaint. The pending case against New York art dealer Nancy Wiener the New York Penal Law 165.54 would be classified as a “B” non violent felony. As a potential first time offender Wiener faces a minimum of one to three years in prison and a maximum of eight and one third to twenty five years. Probation and community service are not options. A person is found guilty of criminal possession of stolen property in the first degree when he knowingly possesses stolen property, with intent to benefit himself or a person other than an owner thereof or to impede the recovery by an owner, and when the value of the value of the stolen property exceeds $50,000. The pending case against New York art dealer Nancy Wiener the New York Penal Law 165.52 would be classified as a “C” non violent felony. As a potential first time offender Wiener faces no minimum sentence but faces as much as five to fifteen years in prison. Alternate sentences include probation, probation coupled with jail, community service, fines and a conditional discharge. A person who knowingly possesses stolen property is presumed to possess it with intent to benefit himself or a person other than an owner thereof or to impede the recovery by an owner thereof. This presumption is often referred to as recent exclusive possession.” There has been a tremendous body of case law addressing this presumption which argues for the position that if an accused has had the exclusive possession of stolen property after a theft crime has been perpetrated and there is evidence or circumstances which show an inability to explain where the property came from, a negative inference may in fact be drawn. That inference being that there is a strong likelihood that the accused knew that the property he or she possessed was stolen. A collateral loan broker or a person in the business of buying, selling or otherwise dealing in property who possesses stolen property is presumed to know that such property was stolen if he obtained it without having ascertained by reasonable inquiry that the person from whom he obtained it had a legal right to possess it. The pending case against New York art dealer Nancy Wiener the New York Penal Law 105.10(1) would be classified as a “E” non violent felony. Punishment ranges for this offence range from no jail with probation to up to four years in state prison. Conspiracy is relatively easy for prosecutors to prove because New York law does not require exact proof of language used in an agreement to commit a crime, and only requires the testimony of one party. As seen in the complaint we published yesterday, there appears to be sufficient testimony to make this conspiracy charge stick. A criminal complaint lists the charges that the prosecuting attorney will file against a person. It typically describes the nature of the offence and consists simply of a signed affidavit by the accuser. A criminal indictment would be a written document, usually presented before a grand jury who decides if the charges warrant further action. Criminal complaints require sworn testimony given under oath for the courts to move forward with the case. UPDATE: Checking records at the New York State Unified Court System for this case, it now appears that this defendant has been indicted on Conspiracy in the fourth degree. The defendant has entered a "Not Guilty" plea and has been released on her own recognisance. Her next court appearance has been scheduled for February 28, 2017.
Who are the players mentioned in the antiquities looting network outlined in the criminal complaint? From the content of the criminal complaint issued by New York prosecutors we get a preliminary outline of the pertinent facts alleged in the case that will then be presented in court should Ms. Wiener's case move on to trial. The portrait painted by prosecutors illustrates what looks to be a complex network of looters, middlemen, and antiquities dealers that suggests the mentioned players have benefited financially from the trade in illicit antiquities for a number of years. allegedly implicated Co-Conspirator #1 in the purchase and sale of the Baphuon Shiva from Cambodia. allegedly reported that Nancy Wiener later told informant #1 that the records no longer existed. allegedly reported seeing objects procured by Co-Conspirator #6 the purchased by Nancy Wiener in New York unrestored, unmounted and/or without bases - classic signs of looting. allegedly implicated Co-Conspirator #5 as being an antiquities smuggler of Tibetan descent based in Nepal and Hong Kong who was in frequent email contact with Defendant about illicit pieces from Nepal. allegedly implicated Co-Conspirator #6 and his father as being suppliers of illicit cultural property from primarily Afghanistan and Pakistan. allegedly sold Nancy Wiener a bronze Buddha sitting on a throne of Naga stolen from Thailand or Cambodia, dated to the 10th Century C.E. allegedly falsified provenance along with Nancy Wiener and Co-conspirator 2 for the bronze Buddha sitting on a throne of Naga stolen from Thailand or Cambodia, dated to the 10th Century C.E. allegedly falsified provenance along with Nancy Wiener and Co-conspirator 1 for the bronze Buddha sitting on a throne of Naga stolen from Thailand or Cambodia, dated to the 10th Century C.E. allegedly implicated by Co-conspirator #1 who stated he gave Co-Conspirator #2 bronze statues in exchange for false letters of provenance. allegedly restored the bronze Buddha sitting on a throne of Naga stolen from Thailand or Cambodia, dated to the 10th Century C.E. despite it having been struck by an agricultural tool, resulting in a jagged break - a sign of looting. allegedly restored the stolen marble Apsara ceiling panel. allegedly restored the Krishna Dancing on Kaliya (cobra) stolen from Tamil Nadu, India, dating from the Chola Period (11th-12th Century). allegedly is an antiquities smuggler of Tibetan descent based in Nepal and Hong Kong. allegedly sold Doris Wiener a silver-inlaid gilt bronze figure of Avalokiteshvara. allegedly incriminated Doris Wiener for providing false provenance on the silver-inlaid gilt bronze figure of Avalokiteshvara. and his father are allegedly suppliers of illicit cultural property from primarily Afghanistan and Pakistan. allegedly grew up in Pakistan and England. allegedly was implicated in several recorded conversations for shipping large quantities of newly dug-up, stolen antiquities from Afghanistan and Pakistan to Thailand, often via Hong Kong, and then to dealers from around the world. 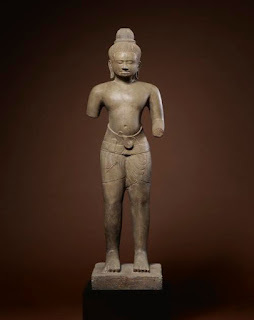 Vaman Ghiya - According to the criminal complaint, seized documents and statements made by informant #2 implicate Weiner in the purchase of the Seated Buddha #1 from Vaman Ghiya, someone who was listed as a long-time supplier from India who often used "Shantoo" to sell his looted antiquities. According to seized documents and informant #1, Doris Wiener was allegedly implicated in buying a stolen mottled red sandstone relief depicting a Bacchanalian scene from Ghiya that Wiener then allegedly falsely claiming that her mother had acquired from a private collection in London. Ghiya is a known antiquities smuggler who allegedly confessed to selling 10,000 objects of Indian art via Sotheby’s—subject of a BBC sting operation. Convicted in 2008 and sentenced to life imprisonment, the conviction was quashed on appeal because of procedural irregularities during the police prosecution. According to a 2007 New Yorker article... "The police found no sculptures in Ghiya’s home. But, in the days that followed, Shrivastava’s men raided half a dozen properties that Ghiya owned around Jaipur, his farm outside the city, and various godowns, or storage facilities, in Mathura and Delhi. They discovered antique paintings, swords and shields, marble panels, stone pillars, three hundred and forty-eight pieces of sculpture, and a dismantled Mogul pavilion the size of a small house." Ranjeet Kanwar - According to the criminal complaint and statements by a former employee of Kapoor, “Shantoo” is the alleged nickname of Ranjeet Kanwar, one of Subhash Kapoor's alleged main suppliers of stolen antiquities from India. His name appears on a computer disk file folder that contained three pictures of looted Seated Buddha #1 found at the Sofia Bros. Storage, in New York County, a storage facility rented by Subhash Kapoor. Om Sharma - According to the criminal complaint, seized emails and statements by informants #1 and #2, it is alleged that Om Sharma is a supplier of illicit antiquities from India. Wiener allegedly bought the stolen red sandstone figure depicting a Jain goddess from Sharma in 2009. The complaint also states that in August 2010, “Victor” had allegedly emailed Doris and Nancy Wiener separately to offer one of the Apsara Marbles, attaching pictures of the dirty, unrestored sculpture on the ground with what appeared to be cut marks. According to statements from informants #1 and #2, “Victor” is the alleged email pseudonym for Om and Badal Sharma. Sharod Singh - According to the criminal complaint, informants #1 and #2, it is alleged that Sharod Singh is a supplier of illicit antiquities from India. According to emails and records provided by informant #1, Doris Wiener allegedly purchased a looted red sandstone relief (“Red Sandstone Couple”) from this individual in 2002 and the allegedly smuggled it into the US via via Kurt Anderson, Inc., a corporation owned by her. The authorities have stated that they executed more than 50 search warrants as part of this investigation. This 12-page complaint filed in Manhattan Criminal Court, signed by Special Agent Brenton Easter of the Department of Homeland Security, lays out the charges against New York art dealer Nancy Wiener through her gallery Nancy Wiener Gallery. The complaint is a textbook formula of how looted antiquities are laundered onto the licit art market through poor controls and a lack of ethics and transparency among the major players in the art market. The transcription below is the html version of the Court's PDF file version located here. ARCA has elected to transcribe the document to make it searchable by future scholars conducting open source research on known traffickers. At the times and places described below in the County and State of New York, the defendant knowingly possessed stolen property with a value in excess of one million dollars with intent to benefit a person other than an owner of the property and to impede recovery by an owner thereof; the defendant knowingly possessed stolen property with a value in excess of 50,000 dollars with intent to benefit a person than an owner of the property and to impede recovery by an owner thereof; the defendant, with intent that conduct constituting a class B or C felony be performed, agreed with one or more persons to engage in and cause the performance of such conduct. Deponent, a Special Agent with DHS-HSI, states that since approximately 2007, he has been assigned to a squad responsible for investigating, among other things, money laundering, smuggling of contraband, art fraud, and the interstate sale and transportation of stolen cultural property. As a Special Agent, Deponent has led or joined teams of agents and officers in the execution of judicially-authorized search and arrest warrants seeking the arrest of individuals and recovery of property and evidence in connection with illegal importations and exportations, and with the interstate and foreign transportation and sale of stolen goods. with the facts and circumstances of this investigation through the following: personal participation; discussions with agents in DHS-HSI and other foreign and domestic law enforcement agencies; interviews of witnesses, including cooperating witnesses that he has worked with on this and other cases; and records and reports relating to, or generated from, this investigation. No attempt has been made to set forth the complete details of this investigation that include tens of thousands of emails, documents, and photographs recovered pursuant to more than fifty judicially authorized search warrants. Statements andfacts listed have been summarized for the specific purposes of this complaint. CONSPIRACY. Between at least 1999 and 2016, with intent that conduct constituting the crimes of Grand Larceny in the First and Second Degrees and Criminal Possession of Stolen Property in the First and Second Degrees be performed, the Defendant utilized her business, Nancy Wiener Gallery, 49 East 74th Street, New York County, to buy, smuggle, launder, and sell millions of dollars’ worth of antiquities stolen from Afghanistan, Cambodia, China, India, Pakistan, and Thailand. A. OBJECTIVES AND METHODS OF THE CONSPIRACY. 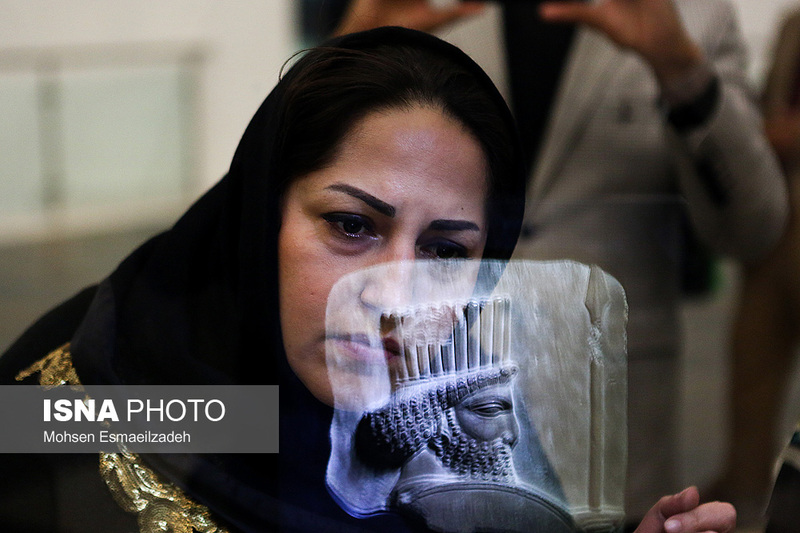 Defendant and her co-conspirators have trafficked in illegal antiquities for decades. Transporting looted cultural property from the site of the theft to the ultimate buyer through intermediary countries in order to hide the true country of origin, Defendant used a laundering process that included restoration services to hide damage from illegal excavations, straw purchases at auction houses to create sham ownership histories, and the creation of false provenance to predate international laws of patrimony prohibiting the exportation of looted antiquities. 1. BAPHUON SHIVA. According to documents provided by informant #1, a dealer in illegal antiquities known to the District Attorney, there was an agreement between Defendant and an antiquities dealer based in London and Bangkok (“Co-Conspirator #1.”) to purchase and sell a Baphuon Shiva from Cambodia, dated to the 11th Century C.E., 39.5 inches high, depicting Shiva standing, and valued at $578,500. Exhibit A.
dealer” for $250,000. According to informants #1 and #2 (another dealer in looted antiquities known to the District Attorney), buying from a “supplier” is an indication of a looted antiquity. Co-Conspirator #1 then shipped the Baphuon Shiva to London to be “cleaned, put together, and mounted.” In my experience, and according to informants #1 and #2, looted antiquities need to be “cleaned” of tell-tale dirt and debris; “put together,” because stolen statues are often cut up into smaller pieces-called “orphans”-for ease of smuggling; and “mounted,” because stolen statues and reliefs are, often cut from their original pedestal or wall. According to seized documents, Defendant then consigned the Baphuon Shiva to Sotheby's New York, for its 2011 sale of “Indian and Southeast Asian Works of Art.” In May 2010, a Sotheby’s employee noted that the Baphuon Shiva had “cracks and joins dressed up with paint splatters to mask repairs.” In my experience, and according to informants #1 and #2, because shovels and picks are frequently used during the clandestine theft of antiquities, such damage is often a sign of looting. According to seized emails, Defendant told Sotheby's the statue had been purchased from antiquities dealer Spink & Son around 1968, but that she had no written proof. In my experience, and according to informants #1 and #2, misrepresenting the true provenance of an antiquity is essential for selling stolen items in the market, because false provenance prevents the items from being easily traced and enables ownership records to be falsified to predate the patrimony laws of the antiquity’s country of origin. Sotheby’s sold the Baphuon Shiva as lot 29 from its showroom at 1334 York Avenue, New York County on March 24, 2011, for $578,500. 2. NAGA BUDDHA. 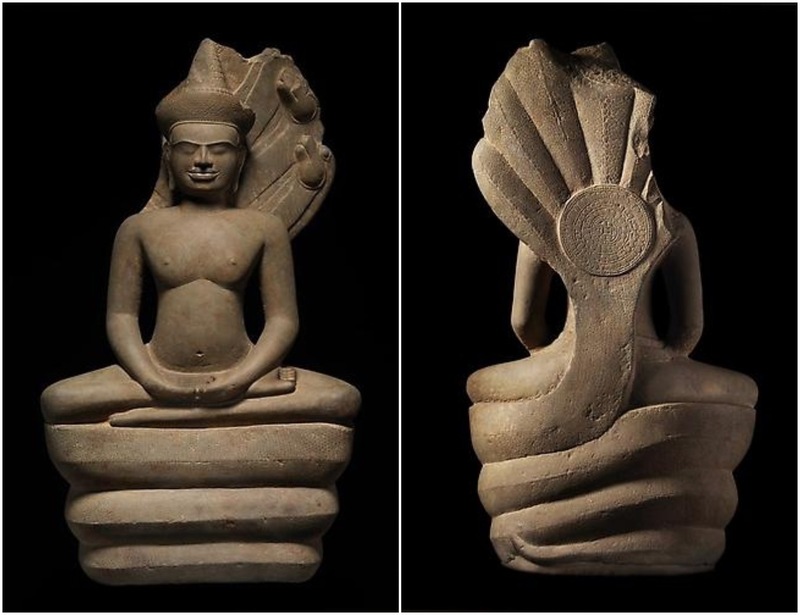 In November 2011, Co-Conspirator #1 sold Defendant for $500,000 a stolen bronze Buddha from Thailand or Cambodia, dated to the 10th Century C.E., 17.75 inches high, depicting Buddha sitting on a throne of Naga (snake), with a market value of $1,500,000. Exhibit B. According to informant #2, the Naga Buddha came from the Khmer Empire-present-day Cambodia and parts of Thailand. email, Co-Conspirator #2 wrote that she had “changed” the provenance “a bit,” asking Co-Conspirator #1 if the changes were “okay.” Co-Conspirator #1 then emailed Defendant, seeking her approval. In another email, Co-Conspirator #1 told Defendant that he typically gave Co-Conspirator #2 bronze statues in exchange for false letters of provenance. In January 2016, Defendant shipped the Naga Buddha to a New York-based restorer (“Co-Conspirator #3”) for restoration, stating its value to be $850,000. In February 2016, Co-Conspirator #3 emailed Defendant a bill for the restoration, noting that the Naga Buddha appeared to have been struck by an agricultural tool, resulting in a jagged break - a sign of looting. Defendant displayed the Naga Buddha for sale for $1,500,000 in the Nancy Wiener Gallery until Deponent seized it pursuant to a warrant in March 2016. 3. TWO SEATED BUDDHAS. In 1999, Defendant possessed, through her gallery, a stolen sandstone seated Buddha, from India, dated to the 1st-3rd Century C.E., 33 inches high and valued at $500,000 (“Seated Buddha #1"). Exhibit C. In 2000, Defendant sold the statue to Singapore’s Asian Civilisations Museum (“Singapore”) without any statement of provenance. Years later, when Singapore requested provenance, Defendant first claimed that Seated Buddha #1 had belonged to an unnamed European collection for at least 35 to 40 years, but then stated that the owner's father had acquired the piece in India. According to seized emails, Defendant then provided a third version: that the piece had belonged to Ian Donaldson, who purchased it when posted to Vietnam between 1964 and 1966. Pursuant to a search warrant executed at Sofia Bros. Storage, in New York County, a storage facility rented by separately charged defendant Subhash Kapoor (“Kapoor”) for his business, Art of the Past, Deponent discovered an unlabeled computer disc containing a folder titled “Shantoo.” According to a former employee of Kapoor, “Shantoo” is the nickname of Ranjeet Kanwar, one of Kapoor's main suppliers of stolen antiquities from India. The disc contained three pictures of Seated Buddha #1; in one, dated “92 11 8,” the statue appearsstill wet as it lay on a dirty floor in front of a makeshift black backdrop. Exhibit D. According to informant #2 and seized documents, Defendant purchased Seated Buddha #1 from Vaman Ghiya, a long-time supplier from India who often used Shantoo to sell his looted antiquities. 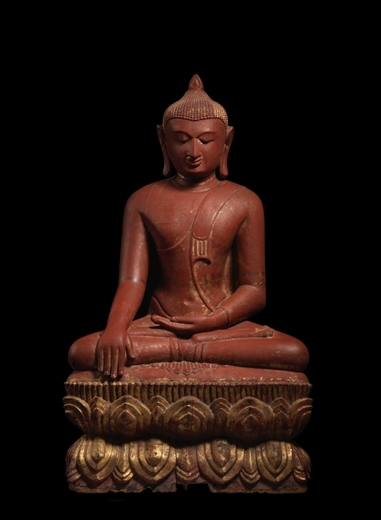 seated Buddha (“Seated Buddha #2”) from Ghiya, possessing it through her gallery until she sold it to the National Gallery of Australia (“Australia”), in Canberra, Australia, in 2007 for $1,080,000. Exhibit E. In May 2006, Defendant told an employee of the NGA that she had purchased Seated Buddha #2 in 2000, “but knew of it several years prior to that,” and that “[i]t was originally purchased in Hong Kong by an Englishman posted there between1964-66.” When asked for proof, Defendant again used the name Ian Donaldson. Thus, for Australia, she claimed Ian Donaldson had been posted to Hong Kong between 1964-66, despite the fact that she told Singapore Ian Donaldson “was posted to Vietnam.” between 1964–66. 4. KRISHNA. 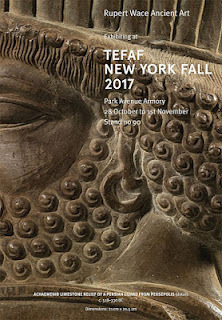 Pursuant to a search warrant executed at Kapoor's gallery at 1242 Madison Ave, in New York County, Deponent discovered a computer with an e-file entitled “travel.” A subfolder entitled “05 10 India” contained pictures of cultural property Kapoor purchased in India in October 2005 and later smuggled to New York. Some of these pictures depict Krishna Dancing on Kaliya (cobra) from Tamil Nadu, India, dating from the Chola Period (11th-12th Century). Exhibits F-G. In the pictures, the statue was still encrusted with dirt - in my experience, and according to informants #1 and #2, this indicates recent looting. According to seized emails, in June 2011, Co-Conspirator #1 emailed Defendant pre- and post-restoration pictures of the stolen Krishna, and requested that Defendant prepare an appraisal to assist in the future sale of the statue. According to a document on her computer, “Asian treasures Final v4,” Defendant provided an appraisal for $3,500,000. Gallery in New York County were transferred to the estate of Doris Wiener, of which Defendant was co-executor. According to informant #1, Defendant removed all records ofwhere, when, from whom, and for how much each piece was acquired (filling multiple file cabinets) and later told informant #1 that the records no longer existed. According to seized emails, Defendant contacted Sotheby's New York to sell the collection, but could not provide documentation that the antiquities had been removed from their countries of origin prior to each country’s patrimony laws. According to Tess Davis, an expert in the laws of patrimony, those years are 1980 for Afghanistan, 1900 for Cambodia, 1982 for China, 1972 for India, 1956 for Nepal, 1975 for Pakistan, and 1961 for Thailand. According to seized emails, Defendant instead consigned the collection to Christie's New York, because their policy requires only that an antiquity have been out of its country of origin prior to 2000 (or 1999 for Cambodia), regardless of that country’s patrimony law. In November 2011, Christie's requested provenance information for the “top 20 lots” of the sale, and Defendant provided a document, “Provenance and Country of Origin Details,” that contained false provenance. According to that document, of the 380 lots in the collection, ten came from Spink & Son (an antiquities dealer Defendant had falsely listed as provenance for other stolen antiquities); and four were originally owned by Doris Wiener (who had consigned them for auction to Sotheby’s or Christie's and then reacquired them - in my experience, and according to informants #1 and #2, this type of straw purchase is a common laundering tactic to create a false ownership history). Of the remaining 366 lots, eight were listed with an ownership history prior to Doris Wiener. Six of those eight listed Sotheby’s or Christie's, one listed a “member of the Diplomatic Corps,” and one listed an actual name. For the 380 lots, then, Defendant provided the name of an owner prior to Doris Wiener (other than Spink & Son) for one lot. Christie's offered all 380 lots for sale from its showroom at 20 Rockefeller Plaza, New York County, on March 20, 2012, resulting in a total sale of $12,796,437. India, dated to the 12th Century C.E., 26 inches high, depicting a Jain goddess, and valued at $74,500. According to these emails, Doris Wiener had seen the Jain Goddess still wet and pre-restoration-signs of looting. Exhibits H-J. She bought the statue in 2009, wiring the money to Hong Kong, and smuggled the piece to her New York gallery. This Jain Goddess was one of the pieces consigned by Defendant to Christie's (lot 48) for its sale of March 20, 2012. According to seized emails, Defendant falsely claimed to Christie's that the Jain Goddess had been in a private collection in London dating back to the 1980s, before her mother acquired it in New York in 2009. It sold for $74,500. This Red Sandstone Couple was one of the pieces Defendant consigned to Christie's (lot 22) for its sale of March 20, 2012. According to seized emails, Defendant first told Christie's that her mother had acquired the relief “in London in the late 1990’s.” During a recorded conversation after the sale, Defendant admitted using a surrogate to purchase the statue for herself at auction—a tactic often used to launder the statue and later sell it at a higher price as a previously “published” piece. According to recovered documents, and to complete the laundering process, Defendant then changed the provenance to “the 1970s,” and received a certificate from the Art Loss Register. In March of 2016, informant #3, another dealer in illegal antiquities, saw the Red Sandstone Couple at the Nancy Wiener Gallery. Defendant offered the relief for sale, using a third provenance: that it had been in her mother's collection since 1992. As proof of its legitimacy, Defendant noted its publication in a catalogue as part of her mother's estate sale at Christie's in 2012. 67). In total, three of these five pieces sold at Christie's on March 20, 2012, for $70,000.00. c. VAMAN GHIYA NETWORK. In August 1992, Defendant sent a fax document to the supplier Vaman Ghiya (listed above), requesting that he “[p]lease call Nancy Wiener at the Hotel Storchen in Zurich immediately.” That same year, according to seized documents and informant #1, Doris Wiener bought a stolen mottled red sandstone relief depicting a Bacchanalian scene, dated to the 2nd Century C.E., 25 1/2 inches high, and valued at $180,000, from Ghiya in India. Exhibit L. This relief was consigned by Defendant to Christie's (lot 20) for its sale of March 20, 2012. According to seized documents, Defendant falsely claimed that her mother had acquired it from a private collection in London. According to seized emails and documents, Defendant consigned to Christie's five other pieces from her mother's collection that had come from the Ghiya Network (lots 20, 21, 27, 45, 49, 55). For two of the consigned statues (lot 49 - Exhibit M and lot 55 - Exhibit O), there were pictures in the Shantoo (Ranjeet Kanwar) file on Kapoor's computer showing the pieces still in situ. Exhibits N and P. Five of these six pieces sold at Christie's on March 20, 2012, for $478,750. d. THE HIMALAYAN NETWORK. According to seized documents and informant #2, Co-Conspirator #5 is an antiquities smuggler of Tibetan descent based in Nepal and Hong Kong who was in frequent email contact with Defendant about illicit pieces from Nepal. According to informant #1, in 2002, Co-Conspirator #5 sold Doris Wiener a silver-inlaid gilt bronze figure of Avalokiteshvara from Northeastern India or Western Tibet (China), dated to 10th-11th C.E., and valued at $812,500. Exhibit Q. This Avalokiteshvara was one of the pieces consigned by Defendant to Christie's (lot 87) for its sale of March 20, 2012. According to seized emails, Defendant falsely claimed to Christie's that her mother had acquired the relief from a “private collection, Europe, early 1990’s.” During a recorded conversation in March 2016, Co-Conspirator #5 was asked if the provenance in the Christie's catalogue provided by Defendant for the “Silver-inlaid Gilt Bronze Figure of Avalokiteshvara,” was accurate. Co-Conspirator #5 laughed and said defendant knew that he had acquired the statue from Tibet and sold it to Doris Wiener. This statue sold at Christie's on March 20, 2012, for $812,500. his father are suppliers of illicit cultural property from primarily Afghanistan and Pakistan. According to several recorded conversations, Co-Conspirator #6 has been shipping large quantities of newly dug-up, stolen antiquities from Afghanistan and Pakistan to Thailand, often via Hong Kong, and then to dealers from around the world for more than a decade. According to seized sales invoices, Doris Wiener purchased 14 stolen antiquities in January 2011 from Co-Conspirator #6, including a gray schist relief Buddha receiving a golden bowl, a gray schist relief Buddha receiving the sheaf of grass, a gray schist relief Buddha and the devotees, all dated to 2nd-3rd Century, all between 17–20 inches high, all from Afghanistanor Pakistan, and valued at a total of $32,000. Exhibits R-T. 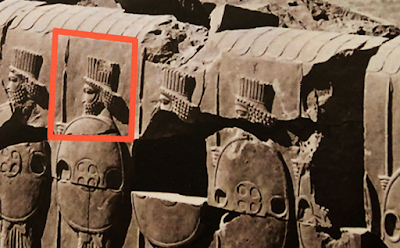 According to informant #1, who saw the artifacts upon their arrival in New York from Asia, they were unrestored, unmounted and/or without bases - classic signs of looting. These reliefs were consigned by Defendant to Christie's (lots 1, 2, 3) for its sale of March 20, 2012. According to seized documents, Defendant consigned to Christie's six other pieces that had come from Co-Conspirator #6 or his father (lots 5, 7, 14, 16, 18, and 38) for the sale. For six of the nine pieces, Defendant falsely claimed that her mother had acquired the pieces from a “Private Collector, Thailand, mid-1980s or earlier” (lots 1, 2, 3, 5, 7, 18). According to informant #2, that provenance was false because the “private collector” was Co-Conspirator #6, who in the mid-1980s was a child living in Pakistan and England. According to seized documents, for two of the three remaining pieces, Christie's altered the provenance, changing Defendant’s “by late 1990s” to “by late 1980s” for lot 14 and changing “2011” to“by 1996” for lot 7. On March 20, 2012, eight of these nine pieces sold at Christie's for $196,500. CRIMINAL POSSESSION OF STOLEN PROPERTY IN THE FIRST DEGREE: NAGA BUDDHA. As noted above, in November 2011, Co-Conspirator #1 sold to Defendant for $500,000 a stolen bronze Buddha depicting Buddha sitting on a throne of Naga (snake), from Thailand or Cambodia, dated to the 10th Century C.E., 17.75 incheshigh. Exhibit B. Defendant displayed the Naga Buddha for sale for its market value of $1,500,000 in her gallery, until it was seized pursuant to a warrant in March 2016. March 2016, Defendant possessed a stolen marble Apsara ceiling panel depicting a female figure (“Apsara Marble”), from India, dated to the 10th Century A.D., 44 inches tall, and valued at $500,000. According to theft reports prepared by the Archaeological Survey of India (“ASI”) and filed with Interpol, a total of six celestial marble statutes were stolen from the ceiling of the Toos temple in India between November 2009 and September 2010. Exhibits U-V. According to seized emails, in September and October 2010, Defendant received several emails about the theft of the Apsara Marbles as well as pictures of the stolen statues. A month earlier, in August 2010, “Victor” had emailed Doris and Nancy Wiener separately to offer one of the Apsara Marbles, attaching pictures of the dirty, unrestored sculpture on the ground with what appeared to be cut marks. Exhibit W. According to informants #1 and #2, “Victor” is the email pseudonym for Om and Badal Sharma (see paragraph 5a above). According to a recorded conversation of a former employee of the Nancy Wiener Gallery, this Apsara Marble arrived at the Gallery around the same time as this string of emails, and then Defendant sent it to Co-Conspirator #3 for restoration. According to emails and documents seized from Defendant’s computer, she was still in possession of the Apsara Marble in March 2016. Tess Davis, a member of the New York State Bar and affiliate of the Scottish Centre for Crime and Justice Research at the University of Glasgow, has conducted extensive field research on the illicit trade in Asian antiquities since 2004. Afghanistan. Ms. Davis is familiar with the cultural property laws of the Islamic Republic of Afghanistan, including the 1980 Law on Protection of Historical and Cultural Properties as modified in 2004, and the 1958 Code for the Protection of Antiquities. According to Ms. Davis, this legal regime protects cultural heritage, vesting its ownership in the state. China. Ms. Davis is familiar with the cultural property laws of the People's Republic of China, which includes the Tibet Autonomous Region, including the Law on Protection of Cultural Relics (of 19 November 1982 as revised on 29 June 1991 and 28 October 2002). According to Ms. Davis, this and the country’s broader legal regime protects cultural heritage, vesting ownership of immoveable and moveable “cultural relics” in the state. India. Ms. Davis is familiar with the cultural patrimony laws of India, including theAntiquities and Art Treasures Act of 1972, along with the Antiquities and Art Treasures Rules, 1973 (updated January 2012), and the Ancient and Archaeological Sites and Remains Act of 1958 (updated in 2010). According to Ms. Davis, this legal regime protects culturalheritage, vesting its ownership in the state. Nepal. Ms. Davis is familiar with the cultural property laws of the Federal Democratic Republic of Nepal, including the Ancient Monuments Protection Act of 1956 as amended in1964, 1970, and 1994. According to Ms. Davis, this legal regime protects ancient monuments and archaeological objects, vesting its ownership in the state. Pakistan. Ms. Davis is familiar with the cultural property laws of the Islamic Republic of Pakistan, including the 1975 Antiquities Act (as amended in 1992), and its predecessors the Antiquities Act of 1968 and Ancient Monuments Preservation Act of 1904. According to Ms. Davis, this legal regime protects archaeological sites and objects, vesting the ownership of undiscovered antiquities in the state. Thailand. Ms. Davis is familiar with the cultural property laws of the Kingdom of Thailand, including the 1961 Act on Ancient Monuments, Antiquities, Objects of Art, and National Museums (as amended in 1992). According to Ms. Davis, this legal regime protects archaeological sites and objects, vesting its ownership in the state. False statements made in this written instrument are punishable as a class A misdemeanor pursuant to section 210.45 of the Penal Law, and as other crimes.